The Arab Spring in Egypt has turned into a hellish summer with countless casualties. Ever since the Egyptian military deposed President Mohamed Morsi, one particular foreign leader has been screaming the loudest, demanding his immediate reinstatement. That bellicose leader is Recep Tayyip Erdogan, the Prime Minister of Turkey, a staunch supporter of his fellow Islamist Morsi and the Muslim Brotherhood. There is no question that a human tragedy is unfolding in Egypt and becoming more critical with each passing day. While no one can remain indifferent to the killing and maiming of civilians, the Prime Minister of Turkey is the last person on earth who should be taking such a self-righteous attitude. Anyone who has blood on his hands has no right to demonize others! One does not have to go back into history and recall the genocides committed by Erdogan’s forefathers against Armenians, Assyrians, and Greeks. Just a couple of months ago, the Turkish Prime Minister’s own hands were soaked in blood when he proudly acknowledged that he ordered the police to open fire on unarmed demonstrators in Istanbul, killing five people, blinding 11, and injuring 8,000 others. Thus, Erdogan has been stripped of all moral authority to lecture anyone else on democracy and civil rights. Erdogan’s repeated meddling in Egypt’s internal affairs and his staunch support for Pres. Morsi and the Muslim Brotherhood escalated the hostilities between the two countries to such a degree that Egypt and Turkey ended up recalling their respective Ambassadors, further disrupting their diplomatic relations. The worsening tension has jeopardized the $2 billion Turkish investment in Egypt and frozen the activities of 300 Turkish businesses in that country. What a difference a year makes! In May of 2012, when I was visiting Egypt on a lecture tour, a local newspaper refused to publish that part of my interview dealing with the Armenian Genocide. I was informed that given the close relationship between the two Islamist nations, it would be impossible to print anything against Turkey. Curiously, after Pres. Morsi’s unceremonious departure from power, a series of articles appeared in scores of Egyptian newspapers, detailing the history of the Armenian Genocide, demanding that Turkey pay restitution to the survivors, and calling on Erdogan to acknowledge his country’s criminal past. Even though Egyptian and Turkish newspapers widely reported the twitter message attributed to the Egyptian President, we were unable to independently confirm its authenticity. However, it is clear that the current Egyptian government and media are intent on using the Armenian Genocide as a way of getting back at Erdogan’s heavy-handed interference in their domestic affairs. 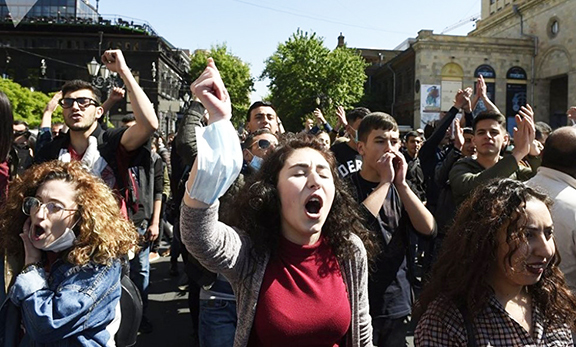 Understandably, most Armenians would be displeased that the victimization of their ancestors is being exploited in a political tug of war between the two countries. Yet, unfortunately, this is politics as usual. If Egypt’s new leaders find it expedient to recognize the Armenian Genocide, this would be a welcome change. It is better to recognize the Genocide, regardless of political motives, than not to recognize it for all the wrong reasons! After all, no one can expect the Egyptian government to take a position on an issue, if it is contrary to its own national interests. In this regard, Egypt is no different from other countries, including the United States and Israel, which periodically dangle acknowledgment of the Armenian Genocide as a Damoclean Sword over the heads of Turkish leaders. The final decision on the recognition of the Armenian Genocide depends on whatever concessions Cairo is expecting from Ankara. If Egypt, the most populous Arab state, recognizes the Armenian Genocide, that would deal a devastating blow to the Turkish government’s frantic efforts to counter the worldwide commemorations of the Genocide Centennial in 2015.
where is ANCA and other organizations when it comes to Syria? turkey has caused more damage to Syria than any arab nation. im sure bashar al assad would recognize the genocide now. after all the biggest Armenian graveyard and concentration camp was in Syria. even today you don’t have to dig to find Armenian bones all over that desert. Don’t count your blessings yet. You can bet your bottom dollar that this has nothing to do with Egypt recognizing the Armenian Genocide. It has everything to do with Egypt wanting to obtain economic and political dividends from Turkey by using the Armenian Genocide as a tool. Of course, Turkey being what it is will do everything to stop the recognition process. Once again, the Armenians will be left with their tails between their legs wondering what happened. Quite a few U.S. diplomats are on the take,look at byzra,amb. to azerbaturk,married a turk,wedding paid for by the azerbaturks,retired in turkey. Another thing I should have mentioned is that these are the same people who burnt down 19 or so Egyptian Coptic churches because they are Christians. The Egyptian Coptic church is one of the oldest churches in the Middle East and Egypt. They are the ancient people of Egypt who accepted Christianity way before the arrival and spread of Islam in the area. How did the “Christian” world react to this act of barbarism? Did the World Council of Churches issue an official letter of condemnation? What about our own Armenian church or the Pope? As you mentioned in your article, everybody is after their own interests. It is a dog eat dog world out there.